D. 10 May 1569 at Ref. David Pitcarne, twelfth Lord of Pitcairn and Laird of the baronies of Drongy and Forthar-Ramsay, succeeded Henry before 1528. Charter on the 21st Feb. of that year, confirmed at Stirling on the 16th May by King James V wherein William Lumesdale of Airdree, for a certain sum of money, sold David Pitcarne of Forthar-Ramsay and Elizabeth Dury his wife two parts of the lands of Forthar-Ramsay in the barony of Airdree in Fyfe, held by the said David and Elizabeth as long as they live together, and of their heirs, whoever they be, and assigns, held under the King in ward and relief. 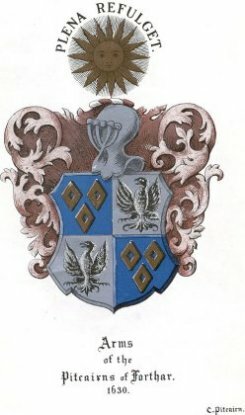 Elizabeth Dury was of the ancient and honourable family of Dury of Dury. George Dury, her brother or kinsman, was Archdeacon of St Andrews and Abbot of Dunfermline etc. George Dury was made Abbot of Dunfermline by James V.
David Pitcarne, twelfth laird of Pitcarne, was now settled at Forthar-Ramsay. This latter estate came into the Pitcairns’ possession through his grandmother, Elizabeth Ramsay, the heiress. It was situated in the centre of Fife, within an easy distance of Falkland on the west and Cupar on the east. It was close to the village of Kingskettle, which belonged to the Pitcairns. The estate of Pitcairn was some miles farther south, near Markinch. David Pitcarne now acquired Freuchy by a grant from the King. Royal Charter on the 29th Sept. 1541 the King granted to David Pitcairn of Forthar, and Elizabeth Dury his wife, the mills of Freuchy and the lordship of the mill lands, which lie in the lordship and county of Fife etc. In 1551 David Pitcairne sold a great part of the estate of Forthar-Ramsay to his son, Mr Robert Pitcarne, who became afterwards Commendator of Dunfermline, was distinguished in history, and whose life is given in full later on. Charter by Mary, Queen of Scots, to David Petcarne of Forthir and his heirs, of the lands of Dunfield in the shire of Fife, of which the one part was resigned by John Weymss of Pittencrieff, and the other by the said David. Reserving to Elizabeth Dury, wife of the said David, her life rent of one-half. Dated at Jedburgh 8th Nov. 1551. In Aug. 1564 Queen Mary confirmed a charter, granted by “Sir David Petcarne and other stallarie of the choir and Cathedral of Glasgow, to Michel Chesholme, of their lands of Kyndally and others in the territory of Glasgow. David Pitcairn twelfth laird of Pitcarne and of the barony of Forthar-Ramsey, died ante 10th May 1569, when his will was proved in Edinburgh.